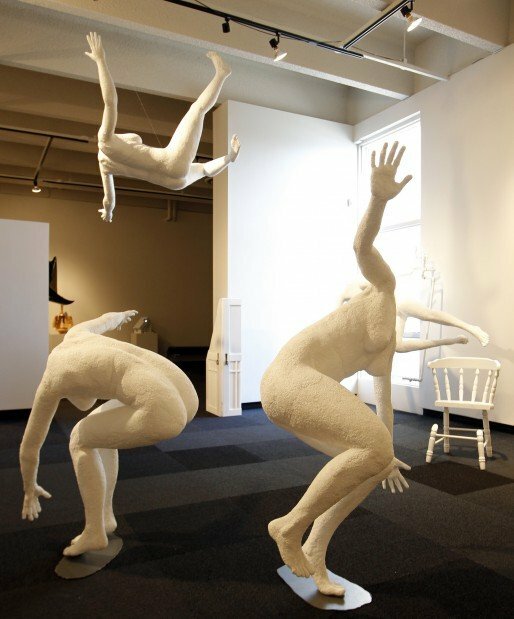 WATERLOO, Iowa --- Human figures carved from Styrofoam turn, twist and bend in various forms of activity and hang from the ceiling in the Forsberg Riverside Gallery at the Waterloo Center for the Arts. In one corner, shards of metal arranged spherically are vaguely reminiscient of a shark's jaw. There are pieces constructed from recycled pieces, digital prints and mixed media scattered throughout the space. Inventiveness, innovation and artistic vision are on display in the "Space Exploration: University of Nothern Iowa Student Sculptural Invitational," now through Nov. 4. In their work artists explored and experimented with a range of media and materials, said Curator Kent Shankle. Students also planned out and installed the exhibition. "When I saw those figures floating in space, I got really excited about the exhibit and was pleased by their attention to detail," he explained. Students are creating pieces based on their "radically unique and personal vision. They're inspired by one another, but maintain their own artistic integrity." Tom Stancliffe, UNI art professor, said the experience of showing work in a professional context is an "important hurdle. As an artist it is your responsibility to make art and get it out into the world. The value of what we do, however, the determination of what is celebrated, collected and ultimately preserved is the responsibility of the culture as a whole. "Having your work shown in the professional context of a museum can therefore be a powerful validating experience for a young artist. It signifies that the door is open, and the community has asked to see your vision. Once that door has been opened many things seem possible," Stancliffe explained. 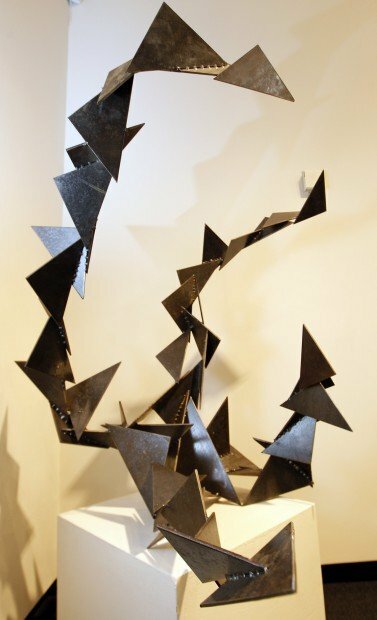 Twenty sculptures and two large-scale installations are displayed from the following artists: Zachary Bowman, Drew Ferkin, Laura Forgie, Brock Jensen, Amanda Kronlage, Brittany Kuhn, Timothy Riefe, Zach Schnock, Dawn Tuve and Corey Wells. Schnock was the recipient of a Friends of the Art Center art scholarship when he was a high school student. What: "Space Exploration: University of Northern Iowa Student Sculptural Invitational"